Sidney Crosby has, once again, etched his name into the NHL history books. With a stellar team effort versus the Winnipeg Jets on February 16, Crosby notched point number 1,000. Midway threw the first period, Crosby got a hold of a bouncing puck in front of the Jets net minder, Connor Hellebuyck. He then threw a pass to Chris Kunitz, who buried it behind the goalie putting the Penguins up 2-0 at the time. That assist brought the crowd to its feet with the announcement of the 1000th point. Crosby came into the game just one point shy of the momentous milestone after tallying an assist versus the Vancouver Canucks two days prior. His performance versus the Jets (finally) put him over the top. 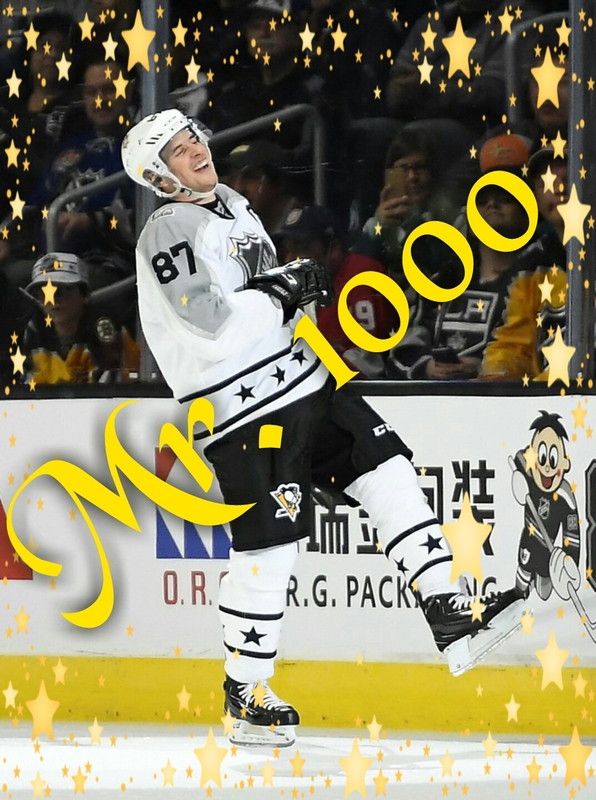 This makes Crosby the second player this season to reach point number 1000. Alexander Ovechkin hit the magic number on January 11, however, Crosby's achievement comes playing in 140 less games. This milestone in Crosby's already illustrious career puts him in a very elite club. This club boasts some of the most notable names in the NHL's 100 year history. Players such as Jaromir Jagr, Jean Beliveau, Pat LaFontaine, as well as the great Mario Lemieux and Wayne Gretzky. His journey to 1,000 points began October 5, 2005 in his first regular season game as a Penguin playing against the New Jersey Devils. Crosby would register an assist on a March Recchi goal giving him point number one in his NHL career. He would go on to score his first NHL goal three days later on *Saturday March 8, 2005 in a loss versus the Boston Bruins. In his rookie year alone Crosby would break Mario Lemieux's rookie assist record and rookie points record. He would also become the youngest player in NHL history to reach 100 points (April 16, 2005). Over the next 12 seasons, Crosby's resume would grow exponentially. Youngest Captain to win a Stanley Cup, two time Hart Memorial trophy wins for league MVP, two Stanley Cup Championships, Olympic Gold Metals, 2016 World Cup of Hockey Champion just to name a few. The list of honors and awards for Sidney Crosby grew year after year (click here for a full rundown of accomplishments). They are all well earned and deserved. It was under much fanfare that Sidney Crosby entered the league in 2005 and by pure luck that he became a Pittsburgh Penguin. By now, the story is well known and his legacy as one of the best to ever play the game continues 12 years later. There is a reason Wayne Gretzky calls him the "greatest player in the world". The stats and the eye do not lie. Congratulations Sidney Crosby! You may wear number 87 but today you are Mr. 1,000! Note: Sidney Crosby would also score the game winner in overtime.